The Police Magnum Large Pepper Sprays are formulated from a pepper solution refined to 2 million scoville heat units. The capsacin and related capsaicinoids % are at the bear spray level of 1.4%. 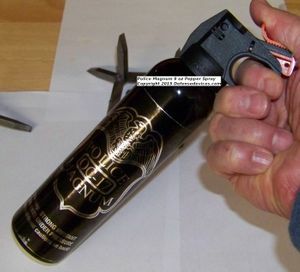 (EPA requires 1% or more to be called bear spray) This makes it one of the hottest, nastiest, and most fearsome defense pepper sprays on the market. Why pay $40 for marketing? This manufacturer private labels pepper spray and does not spend huge amounts on marketing. So, we can pass on the savings to you. This 9.5 inch tall can holds almost a pound of the blistering creation and can envelope a gang of attackers, whether human or not. It can create a cloud to 20 feet easily and allow you to stop the danger from getting anywhere near you. (You can't miss) Stop multiple attackers, gang bangers etc. instantly. Keep one in the house, office, hiking etc. The firemaster top is secure with an orange safety to avoid any accidents. The design is slim (2 inch diameter)so it's easy to hold. Get one for the home, camper, office, shop, etc. at this great price. Like all pepper sprays, only ground shipping is available for this item. We cannot ship Police Magnum pepper spray to NY, MA, WI, HI, AK, PO boxes or APO addresses. Carry this pepper spray in comfort and have it handy by getting a belt or thigh holster at the same time.